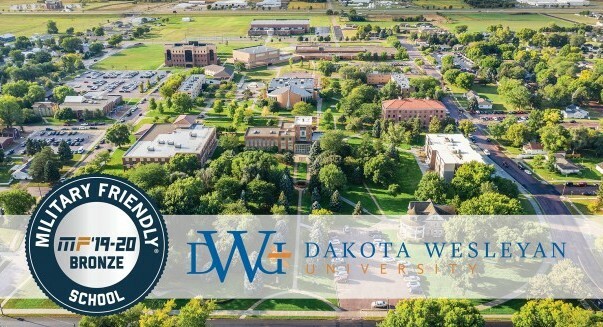 Dakota Wesleyan University has been named a Bronze Military Friendly® School for 2019-2020. Military Friendly® is in its 10th year and this list provides a comprehensive guide for veterans and their families using data sources from federal agencies and proprietary survey information from participating organizations. The 2019-2020 list will be published in the May issue of G.I. Jobs magazine and can also be found online at www.militaryfriendly.com. Methodology, criteria and weightings were determined by VIQTORY with input from the Military Friendly® Advisory Council of independent leaders in the higher education and military recruitment community. Final ratings were determined by combining the institution’s survey scores with the assessment of the institution’s ability to meet thresholds for student retention, graduation, job placement, loan repayment, persistence (degree advancement or transfer) and loan default rates for all students and, specifically, for student veterans.